A group of scientists try to prevent nuclear war by creating a common enemy to unite humanity, and things do not go well. The road to Hell is paved with good intentions. While an extreme effort to prevent a nuclear holocaust is certainly admirable, the literal execution of their plan was utterly cruel. Could it even have worked? The details of how the winner of their unfortunate lottery, Allen Leighton (Robert Culp), underwent total body transformation to become a faux alien were truly horrifying. Dr. Gainer changed Allen's skin, his senses, and every organ in his body. In the end, Allen couldn't focus his eyes, breathe the air on Earth, or even talk without artificial assistance. "Toothache in arm. Eyeballs itch. Headache in back of neck." Much of the transformation was shown to the audience in silhouette, something The Outer Limits did a lot, probably because what we imagine is always scarier than what we can actually see. In one earlier scene, Allen's face was in shadow as his cheek started to move all by itself. That was probably literally tongue-in-cheek, but still creepy. I'll admit it, medical horror gets to me. Which is why I usually avoid it. There were two exceptions to Allen's lack of emotion. 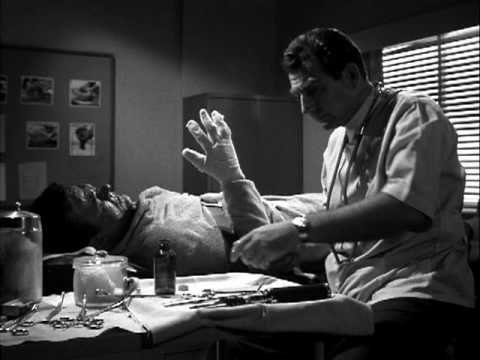 The first was the startling scene in the middle of the episode where Allen went nuts and Robert Culp chewed the scenery with great abandon, calling himself "Caliban with a Ph.D." The way he was aiming the x-ray machine at the doctors reminded me of how creeped out I've always been about radiation whenever I have an x-ray. It also made me think about Nazi experiments. Allen also showed emotion when his wife Yvette told him that her doctor had said her heart murmur, the reason they hadn't had children, was no longer an issue, and admitted that she was window shopping for maternity clothes. Yvette seemed to have a psychic link of sorts with Allen; she certainly sensed that something terrible was up. The writers set up that "mark against evil" gesture early so that Yvette would recognize Allen at the end of the episode when he was dying, trapped in an alien body and unable to talk. When they moved the completely transformed Allen, they covered him with a sheet, hid him in a coffin, and transported him in a hearse that went right past the "From Here to Maternity" shop. Geez, no symbolism there. It was impossible for me to like Phil. If it was his idea in the first place, man, he should have gone through the transformation himself. Although Phil was clearly upset early on, later he said emotionlessly that their plan only had a 70 to 80 percent chance of success. But hey, these scientists were impressive. Along with completely transforming Allen's body, they managed to create a super metal for the alien capsule and then put the capsule into orbit, not to mention that they created a ray gun that completely disintegrated a station wagon. We never actually do see the little Theta alien in the cage, except in silhouette. Did it actually come from another planet? How? Did it land here? If so, why was it a secret? Did the scientists decide to create a human-size replica because the little Theta was so small and therefore unthreatening? (I'm thinking of a certain scene in Buffy the Vampire Slayer with the punchline of "actual size.") Or was it a miniature prototype of sorts, created from an animal, poor thing? Not knowing what was in the cage, never getting a good look at it, made it creepier somehow. The other big unanswered question was Yvette's pregnancy. If she conceived after Allen took that no-way-back injection, and it seems obvious that she did, would it have affected the baby? Near the end of the episode, Yvette was coming down the stairs, and even though she wasn't showing yet, the shadow on the wall made it look like she was hugely pregnant. That was definitely an intentional bit of creepiness to make the audience think that she might be carrying a monster. The photography in this episode was outstanding: the darkness in the board room when the scientists were choosing lots, the dense shadows in the corners of the lab, the way they showed Allen and the little Theta alien in silhouette, Yvette's face completely obscured by shadow as she is overcome by tragedy. 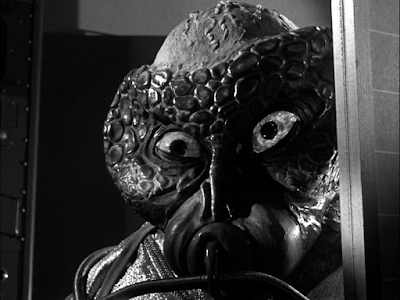 Honestly, I think The Outer Limits was scarier because it was completely in black and white. 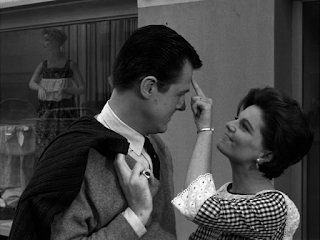 — Robert Culp, who gave an excellent performance, also starred in two other episodes of The Outer Limits including the most famous one, "Demon With a Glass Hand." Geraldine Brooks gave a touching performance as Yvette. — There was a scene in which Allen was wearing white tennis shoes. Robert Culp was the star of a series called I Spy that ran from 1965 to 1968, in which he played a CIA agent who traveled undercover as a tennis pro. — There were several scenes of Robert Culp with his shirt off. Not so much after he started growing scales. — I really love the title of this episode. It's perfectly descriptive, because every bit of the plot was about the fear experienced by the scientists, as well as the rest of the world. Not to mention Allen and Yvette. — Diversity watch: Even though they were all male, the cabal of scientists had some racial diversity. Good for them. — During its initial airing, some television stations thought Allen's final transformation was too scary and edited it out. — While the scientists were putting their names on paper to draw lots, I thought, wouldn't some of them put someone else's name on that paper? Yvette: "Some scarecrows don't even scare crows." Phil: (pretending to read Allen's palm) "Ah, yes. I see a long journey in your future, during which you will become a tall, dark stranger." Wow. That was just incredibly cruel.